A bibliography of music for the guitar printed in Sweden with locations of the works. This bibliography can also be found in Guitar and Lute Issues published by Matanya Ophee. In English. The Swedish version: Musik för gitarr utgiven i Sverige 1800-1860. A short history of the guitar in Sweden. In English. An article in Swedish about two early Swedish guitar methods and about a preserved Swedish Guitar by Lorents Mollenberg. A catalogue of early prints and manuscripts for the guitar and the Swedish lute in the collection of Kenneth Sparr. The catalogue spans the period 1760-1900. The collection contains many Swedish and French prints. The pages are regularly updated. A catalogue of books and prints concerning the guitar and the lute in the collection of Kenneth Sparr. A biography over the Swedish musicologist and music collector Daniel Fryklund. About Daniel Fryklund as collector, researcher and pioneer in Swedish research about the guitar. In Swedish. About a recently discovered French song by Fernando Sor, now housed in the Music Library of Sweden. A translation into Swedish of the guitar chapter in J-C Maugin's handbook for instrument builders. The original French edition was published in 1834. In Swedish. A short article about a lesser known French guitar composer and with his lithographed portrait. An English version of my article Due pezzi sconosciuti di Fernando Sor [il Fronimo 36/2008 No, 144 pp. 28-38] A Japanese version can be found in Guitar dream No. 17 June-July 2009 pp. 10-17. A Swedish version, Två okända verk av Fernando Sor, was published in Gitarr och Luta 42/2009 Nr 2, pp. 20-26. About a little known Swedish nineteenth century guitar tutor and its aauthor. In Swedish. Barthélemy Trille Labarre ‘professeur de guitare et compositeur – Élève d’Haydn. 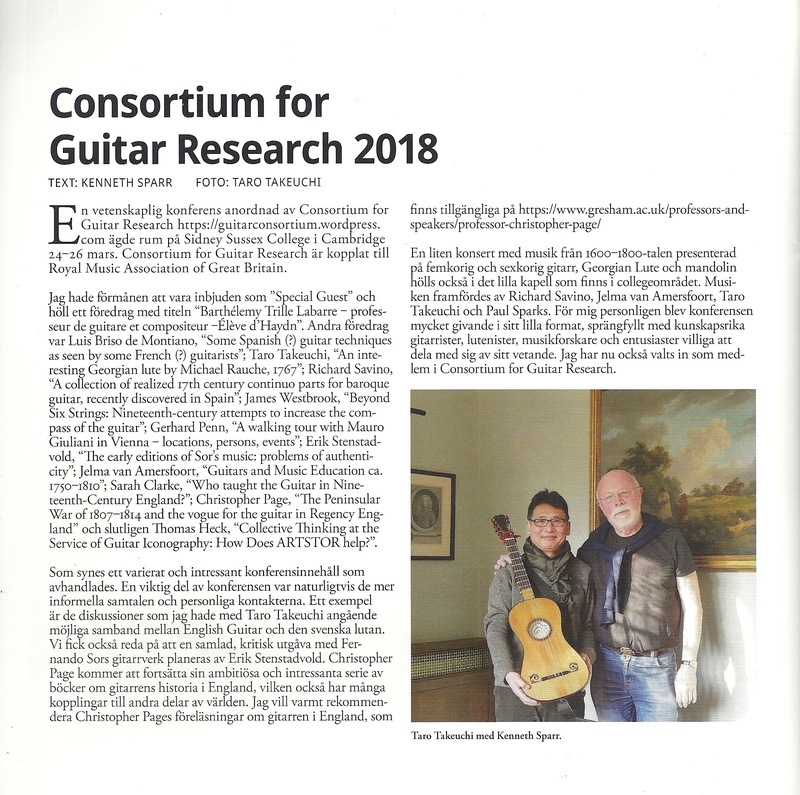 Paper presented at the Consortium for Guitar Research colloquium, Sidney Sussex College, Cambridge, 24-26 March 2018. An article about the two versions of Jost Amman's famous wood-engraving of a lute maker from 1568 and 1574 respectively based on two originals in the collection of Kenneth Sparr. With some information about the biography of Jost Amman. A biographical survey of the life of David Kellner, composer for the lute, organist, carilloneur etc. together with a bibliography of his works. In English. David Kellner – ett musikeröde. Kenneth Sparr berättar. Stephen Stubbs och Jakob Lindberg spelar lutmusik av Kellner. Intervju: Ingemar von Heijne. Sveriges Radio P2 1990-05-05 kl. 22.00-22.30. "The improved cittern" Printed and Manuscript Music for the Swedish Lute and a List of Swedish Lutes. A catalogue of music for and an introduction to the unique Swedish lute (or theorbo), a musical instrument in vogue c. 1780-1820. Also in a Swedish version as "Den förbättrade sittran" Musik i tryck och handskrift för den svenska lutan samt förteckning över svenska lutor. Israel Pourel - Lutenist and Musician in 17th Century Stockholm. About the Swedish lutenist and musician Israel Pourel active in the late 17th and the early 18th centuries. Also in a Swedish version as "Israel Pourel - Lutenist och musikant i stormaktstidens Stockholm" The English version of the article was first published in Luths et luthistes en Occident - actes du colloque 13-15 mai 1998. Paris 1999, pp. 217-233. French Lutenists and French Lutemusic in Sweden. About French lutenists and French lute music in Sweden during the 17th and the early 18th centuries. About the lutenists employed at the Swedish court in the mid 16th century. About the lutenist Hinrich Niewerth employed at the Swedish court in the late 17th century. About a poem by Johann Ulrich von König on the lute playing of Silvius Leopold Weiss and also about a possible link between Weiss and David Kellner. About the 'Stammbuch' of Hans von Bodeck (1582-1658) and the entries made by Dowland, Campion and Rosseter in the early 17th century. About the anonymous manuscript Swedish baroque lute tutor in the Lund University Library. About the unique 16th century broadside lute instruction published by Mateo Pagano and now in The Royal Library, Stockholm. About the French lutenist and composer, together with a catalogues of his known works and concordances. An article about a unique painting from the beginning of the 18th century showing a Swedish lute being played. Published in Dokumenterat 34 - Bulletin från Statens musikbibliotek, Stockholm 2003. In Swedish. Jonas Elg: An Eighteenth-Century Lute and Violin Maker in Stockholm, Sweden, and his 15-course Baroque Lute. Galpin Society Journal LXV March 2012, pp. 23-59, 168-172. Also presented as a paper at The American Musical Instrument Society, 40th Annual Meeting, The Musical Instrument Museum, Phoenix, Arizona May 18-22, 2011. Prosten Nohrborgs luta (in Swedish). Spaning nr 20-21, 2013, pp. 62-65. An article (in Swedish) by Mats Krouthén about the piano maker Johan Gabriel Högwall in Gothenburg, active the late 18th and early 19th century. The most comprehensive biography about Daniel Fryklund, the Swedish collector of musical instruments, musicalia and musicologist. A catalogue of literature about music in Kenneth Sparr's collection, including literature about the guitar and the lute. Sale catalogues with books about and music for the lute and the early guitar as well as drawings. Both new, second-hand and antiquarian titles are offered. Perhaps one of the more complete listings of books and music concerning these instruments. Other antiquarian music is also offered. Hinrich Niewerth - Lutenist at the Royal Swedish Court [The Lute XXIV Part 2, 1984-]. Raphael Mests luta [Linköpings biblioteks handlingar Ny serie band 10, 1984, pp. 4-23]. An updated Swedish version of this article can be found here. An updated English version of this article can be found here. French Lutenists and French Lutemusic in Sweden. [Le luth et sa musique II, Paris 1984 pp. 59-67]. Lutenists at the Royal Court of King Gustavus I of Sweden [The Lute XXV Part 2, 1985, pp. 69-80]. Lutan i Sverige - tiden 1520-1560 [SGLS 19/1986 No. 1 pp. 18-36]. ]. Also in English as Lutenists at the Royal Court of King Gustavus I of Sweden . A Poet's Description of the Lute Playing of Silvius Leopold Weiss, and a Possible Link Between Weiss and David Kellner [Journal of the Lute Society of America 19/1986 pp. 58-67]. Charles de Lespine - Sverigeresenär, poet, dramatiker, lutenist och kompositör [Bokvännen XXXXII/1987 pp. 107-112; Gitarr och Luta 21/1988 No. 1 pp. 53-58]. An Early 18th-Century Swedish Lute Tutor [The Lute 26/1986, Part 2, pp. 75ff]. An Unknown and Unique Broadside Lute Instruction [The Lute 27/1987 pp. 31-35] . Some unobserved information about John Dowland, Thomas Campion and Philip Rosseter [The Lute 27/1987 pp. 35-38] -]. Gitarren i Sverige under tidigt 1800-tal - om svenska gitarrskolor och instrumentmakare [Gitarr och Luta 21/1988 No. 3 pp. 46-55]. David Kellner a Biographical Survey [The Lute 29/1989 pp. 3-36]. A German version of this article appeared in Wolkser Wasserturmbote - Liebertwolkwitzer freies Informations- und Nachrichtenblatt Nr. 124-127, 2001. Musik för gitarr utgiven i Sverige 1800-1860 [Svenskt musikhistoriskt arkiv Bulletin 24, Stockholm 1989 s.20-40]. Also in English as Music for the Guitar Printed in Sweden 1800-1860 or in Guitar and Lute Issues. The Guitar in Sweden to the mid 19th Century [Soundboard 17/1990 No. 1 pp. 16-23]. "Israel Pourel - Lutenist och musikant i stormaktstidens Stockholm" [Gitarr och Luta 25/1992 No. 2 pp. 49-57] . An English version of this Israel Pourel - Lutenist and Musician in 17th Century Stockholm. can be found in Luths et luthistes en Occident - actes du colloque 13-15 mai 1998. Paris 1999, pp. 217-233. En fransk gitarrbyggbeskrivning från 1830-talet [Gitarr och Luta 27/1994 No. 1 pp. 22-31]. David Kellner a Biographical Survey [Balticum - a Coherent Musical Landscape in 16th and 18th Centuries. Ed. by Irma Vierimaa. Studia musicologica universitatis helsingiensis VI. Helsinki 1994. pp. 63-90]. En viola da mano-spelare från tidigt 1500-tal [Tidskrift för tidig musik 16/1994 No. 4 pp. 4-5]. En viola da mano-spelare från tidigt 1500-tal [Gitarr och Luta 28/1995 No. 1 pp. 23-24]. An unknown French song by Fernando Sor in Sweden [Soundboard Vol. XXII, No. 1 pp. 39-43]. Daniel Fryklund - samlare, forskare och pionjär inom svensk gitarrforskning [Gitarr och Luta 30/1997 No. 1 pp. 11-14]. Israel Pourel - Lutenist och musikant i stormaktstidens Stockholm" [Vallonättlingen 1998 No. 3 pp. 14-19, No. 4 pp. 24-27]. A Lute by Raphael Mest in Sweden [The Lute XXXVIII/1998 pp. 1-28]. In Swedish as Raphael Mests luta i Linköping [Gitarr och Luta 36/2003 No. 4, pp. 32-43]. Raphael Mests luta i Linköping [Gitarr och Luta 36/2003 No. 4 pp. 32-43]. Den svenska lutan i en anonym målning från 1800-talets början [Dokumenterat 34 - Bulletin från Statens musikbibliotek, Stockholm 2003, pp. 25ff. In Swedish. Due pezzi sconosciuti di Fernando Sor [il Fronimo 36/2008 No, 144 pp. 28-38]. The English version Two Unknown Guitar Works by Fernando Sor Also published in Japanese in Guitar dream No. 17 June-July 2009 pp. 10-17. This also includes an edition by Jun Sugawara and Hirokazu Sato of the Madrid manuscript as well as a recording of the edited music. A Swedish version, Två okända verk av Fernando Sor,, was published in Gitarr och Luta 42/2009 Nr 2 pp. 20-26. Remarks on an Unnoticed Seventeenth-Century French Lute in Sweden, the Swedish Lute (Svenskluta or Swedish Theorbo) and Conversions of Swedish Lutes. Galpin Society Journal LXII April 2009, pp. 209-234. Articles on Sveno Beckman, Jonas Elg, Johan Jerner, Lorents Mollenberg, Johannes Mothe, Johan Öberg and the Svenskluta in The Grove Dictionary of Musical Instruments, New York 2014.